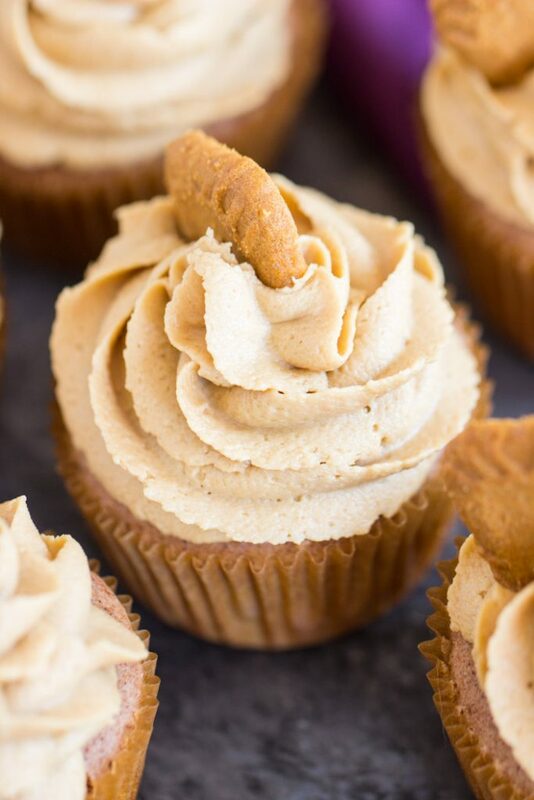 These Biscoff Cookie Butter Cupcakes are simple snickerdoodle cupcakes, filled with a generous scoop of cookie butter, and topped with Cookie Butter Frosting! 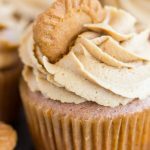 These Cookie Butter Cupcakes are as easy as can be, and loaded with cinnamon and warm spices from top to bottom! 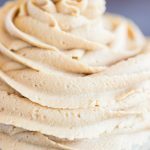 So what do you put that fabulous Cookie Butter Frosting on? As we discussed earlier this week, you put it on anything. Really. 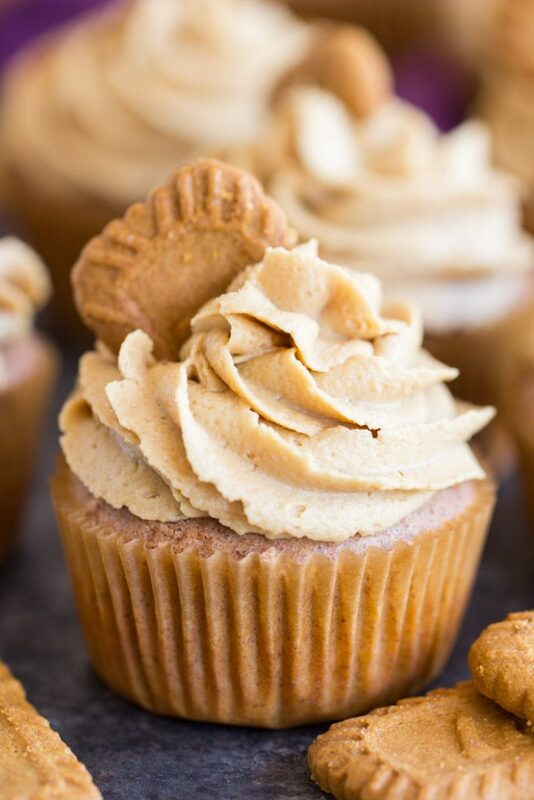 But to be more helpful and specific than that, I’ll give you a few ideas, starting with these Biscoff Cookie Butter Cupcakes. 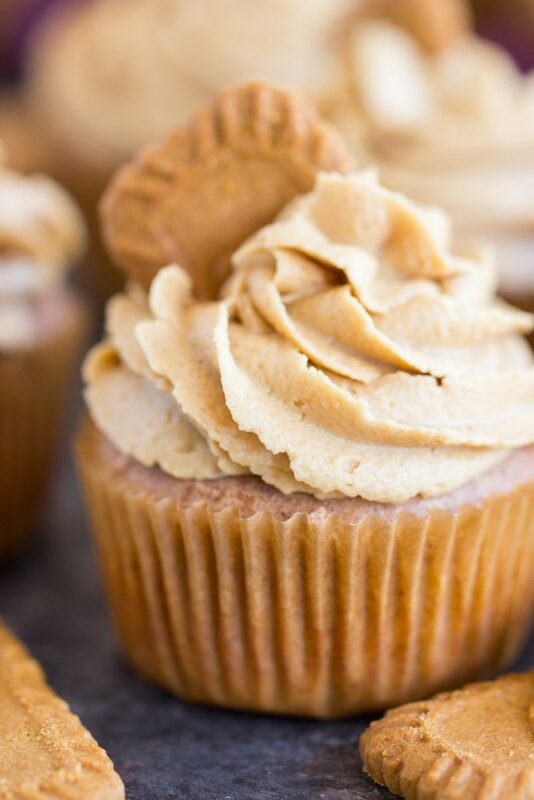 Let’s break them down real quick: these Cookie Butter Cupcakes start with a simple snickerdoodle cupcake batter (like the cupcakes in this recipe for Apple Pie Cupcakes with Snickerdoodle Frosting), and it’s basically white cake crammed with a TON of cinnamon. Then I filled those snickerdoodle cupcakes with a generous spoonful of cookie butter, and topped them with a massive swirl of Cookie Butter Frosting. Cinnamon from top to bottom. But it’s even more than that. Cookie butter is so much better than just being cinnamony. It’s indescribable, but it’s way better than just a cinnamon spread, ya know? 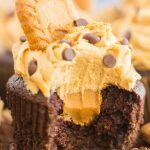 Almost everything pairs really well with that Cookie Butter Frosting, and it complements a lot of things! It’s strong on cinnamon and warm spices, it’s smooth, creamy, and sweet. It’s light, fluffy, and rich. What doesn’t go with it? My infatuation with Cookie Butter Buttercream started with a snickerdoodle-themed dessert though, so I felt I needed to go back to those roots. It was these Snickerdoodle Thumbprints with Cookie Butter Buttercream. Those cookies are a dream. 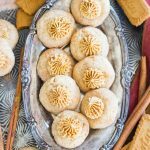 Soft, buttery thumbprints, dusted with cinnamon-sugar, and filled with Cookie Butter Frosting. 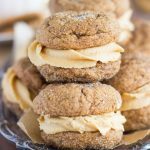 Then there’s these Oatmeal Sandwich Cookies with Cookie Butter Frosting, and these Soft Molasses Ginger Cookie Sandwiches with Cookie Butter Buttercream. I lose my mind over those soft molasses cookies just by themselves. They are the perfect example of a cookie that melts in your mouth. But then you sandwich them with Cookie Butter Frosting, and you get to know what a match made in heaven that cookie butter is with gingery things. I’m not like a cookie butter fanatic or super fan (although I do love the stuff and think it’s completely wonderful), but I do get on kicks with things, and when inspiration keeps coming, I don’t really squelch it. 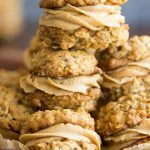 I made a few other delicious cookie butter treats over the summer, so I hope you don’t mind. 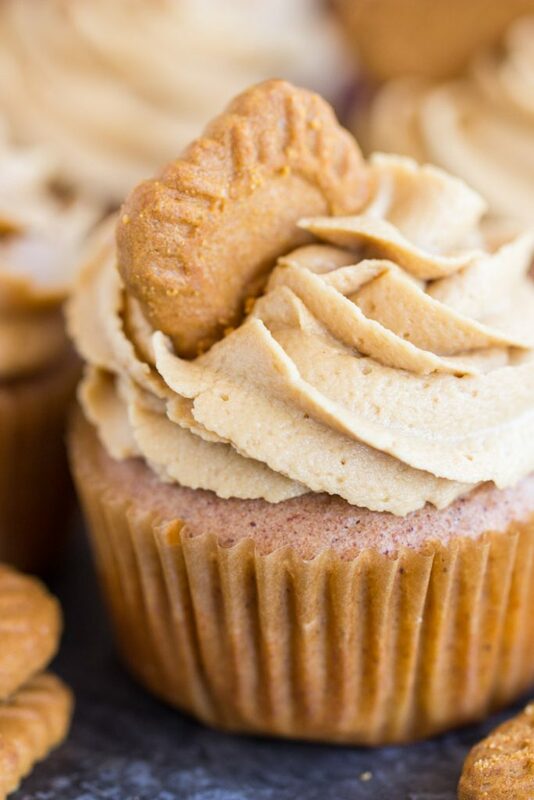 These Biscoff Cookie Butter Cupcakes were a recipe that I’ve been so excited to share, but wanted to wait til it was a little closer to fall. 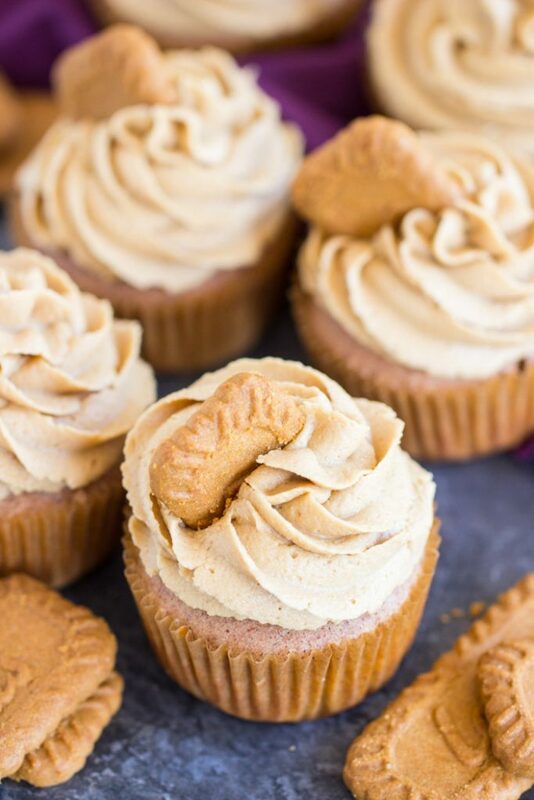 If you’re wanting to get into an autumn mood, but you aren’t ready for pumpkin recipes yet, these Biscoff Cookie Butter Cupcakes are a good place to start! 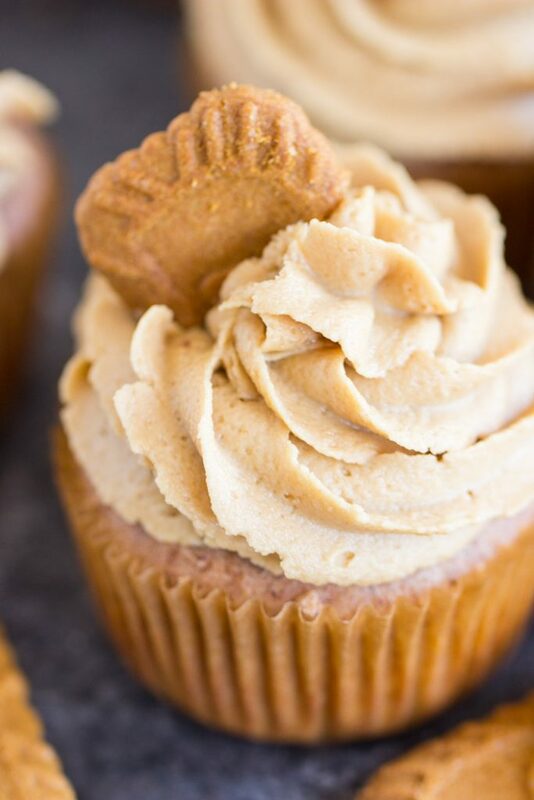 Biscoff Cookie Butter Cupcakes! Simple snickerdoodle cupcakes, filled with a generous scoop of cookie butter, and topped with Cookie Butter Frosting! Line 24 regular-sized muffin cups with paper liners, and fill them halfway with batter. Bake at 350 degrees for about 15 minutes, or until a toothpick inserted near the center comes out clean. Using a spoon or cookie scoop, scoop a 1-inch ball out of the center of each cupcake. Set aside for another use (cake balls, maybe?). Spoon a rounded teaspoonful of cookie butter into the center of each cupcake. For more favorite cookie butter recipes, check out these Cookie Butter Rice Krispie Treats that you can make as easily as classic RKTs. Ready in minutes! I also have a fabulous cookie butter cheesecake that is quick and no-bake, this Cookie Butter Cheesecake with Biscoff Crust. And if you love snickerdoodle-themed desserts, this Snickerdoodle Poke Cake Layer Cake is one of my favorite recipes on the entire blog. It’s so impressive to look at, but so easy.